Grapes are an important established crop in New York, Pennsylvania, and portions of New Jersey; they also are an emerging and expanding crop in southern portions of the Northeast region such as Maryland and throughout the New England states, where the introduction of new cold-tolerant cultivars now allows production in regions where low winter temperatures previously precluded cultivation of this crop. Grapes have become particularly popular in these new regions because they can provide growers opportunities with value-added wine production and unique agritourism offerings. The expansion of grape production into regions where there is little experience with this crop or extension infrastructure dedicated to its support entails an additional set of challenges for new growers. A diverse stakeholder group of Northeast growers, researchers, organic association technical personnel, IPM practitioners and extension specialists were gathered to develop a Northeast Grape PMSP that accurately reflects the current insect, weed, and disease problems in Northeast grapes and the IPM management strategies for those pests. Prior to the 2016 Grape PMSP meeting participants were asked to list the key pests, diseases, and weeds in order of importance in grape. This survey was substituted as a cost?effective and efficient replacement for a Crop Profile and Survey. The list of key pests for grape included three insects, five diseases, and the weeds and vertebrates common in agricultural settings. The key pests are typically persistent problems that need to be managed every year. Of special note, there are other current and emerging pests that annually affect the crop to lesser degrees but can be damaging when outbreaks occur. The impact of direct damage from Spotted Wing Drosophila is still being assessed but awareness of potential threat is high and there is an educational need for management decision knowledge and planning. Anthracnose and Crown Gall occurrences are increasing. There is a need for research to increase understanding of biology and management of these diseases as well as for Trunk Dieback and Sour Rot complexes. This PMSP addresses all grapes grown in the Northeast region: interspecific hybrid cultivars, including the new cold-climate varieties used for wine and table grape production; Vitis vinifera cultivars that form the backbone of the premium-wine segment of the industry; and V. labrusca-based “native” cultivars, used for unfermented grape products, traditional sweeter wines, and table use. In addition to providing an in-depth educational opportunity for those participating in the development of the PMSP, the group also identified critical priorities that can be used to develop a plan for future research, extension, and regulatory needs for grapes in the Northeast. 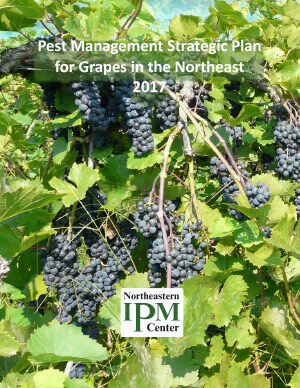 Download: Pest Management Strategic Plan for Grapes in the Northeast 2017.